Spotify music streaming service is beloved around the world, which has the perfect tune to whatever mood you're in; and its lovely songs are always on point and can be relatable to any situation you’ve been in. 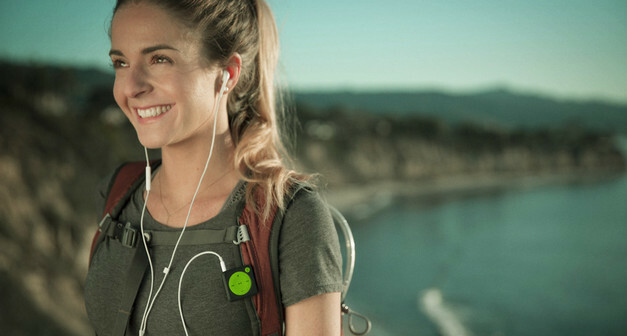 For sports lovers, taking a portable Spotify player during runs, hikes, and trips will be a great way to enjoy Spotify music more handily than lugging smartphones around or strapping to your arm. Imagine that you can listen to Spotify music via a portable player like an iPod which was installed Spotify application without worrying about the storage of your fragile phones. How splendid a moment it is! Need a portable MP3 player for your Spotify playlists? Mighty promises to be the answer. Mighty was born from personal frustration with the current on-the-go music experience. It is also designed for fitness fanatics who don’t want to carry a smartphone, but still want to listen to music on Spotify. With its help, now you can “enjoy your workouts, commutes, and adventures without worrying about bulky phones, data overages, and battery drain.” Using the Might Audio player just requires a Spotify premium membership. It equipped with Bluetooth and WiFi, is compatible with iPhones and Androids, and works by storing your Spotify playlists offline, so that you can enjoy Spotify Music without an internet connection. Measuring 1.5 x 1.5 x 0.3 inches and weighing 0.6 ounces, Mighty makes for a compact music player that you can clip any place where they won’t interfere with your activities. It is made of plastic, comes with a clip and looks durable. It is water and drop resistant, after all. The audio player has 8GB of internal storage, which is just enough room for about 1,000 songs (about 48 hours of music) at Spotify Premium's highest quality audio. The Mighty team says the music player is good for up to 5 hours of continuous playback. “Mighty is the first and only device that takes your streaming music on-the-go without being connected to a smartphone.” Smartphones are heavy, hard to carry during exercise, and have fragile and expensive screens. The iPod Shuffle is an alternative that provides a comfortable music+fitness experience, but it can’t play any streaming music. 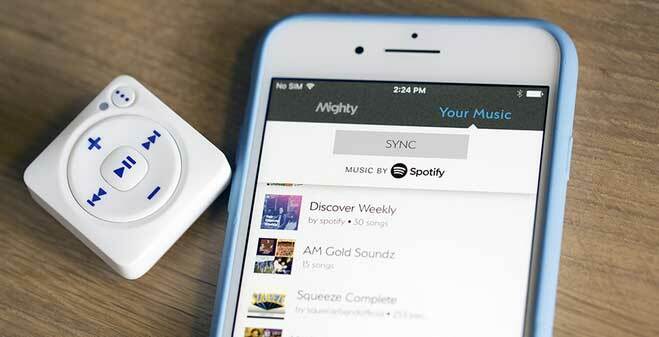 Mighty is the first device ever to play Spotify music on-the-go without any need for a smartphone. Mighty is screenless and comes with a companion mobile app that acts as a remote control for music selection and syncing. It is easy to get started; you can sync your Spotify playlist to your Mighty player within a few clicks. 1. Download the Mighty app to your phone and sync up both devices via WiFi. 2. Direct you to the familiar Spotify interface to choose which playlists you want to take with you. 3. Transfer hundreds of songs from your library to Mighty. If you ever want to add a new playlist, you can easily do it using the app’s ‘Manage My Music’ feature providing Mighty is in WiFi range. 4. Once the sync is complete, put your phone down and take Mighty with you on-the-go. You won’t need your phone again until you want to change your playlist selections. Apple may have killed off the iPod as people switched to smartphones and streaming services, but it's increasingly clear dedicated portable music players still have a place in the market. Mighty combines sports with music, is the first portable device that can play Spotify on the move without the use of a smartphone or internet connection. It delivers a new experience and could be the best way for some Spotify premium user who wishes to stream Spotify music on the go even without your phone nearby. The Mighty Audio device is currently available for sale on the company’s website for $86. 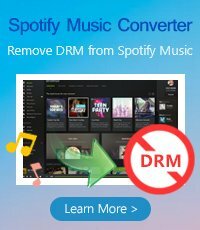 Mighty is great way for Spotify Premium users to store offline music and stream on the move, but how about Spotify free? It is generally known that downloading Spotify music offline is Spotify paid users' exclusive privilege. Spotify Free user can only stream music online in shuffle mode. Is there any other way to get offline Spotify music without upgrading to Premium plan? 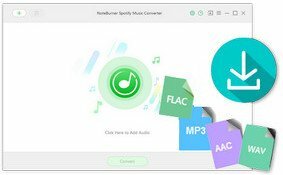 Well, you are in luck, Spotify Music Donwloader could be the pretty great choice to help you download music or playlist from Spotify even you are a Spotify Free user, and convert them to plain MP3, AAC, FLAC or WAV with 100% original quality. In this case, you can easily transfer your Spotify playlist to more devices for streaming, such as iPod, portalb MP3 player, car stereo.